We’ll start today’s topic where most people start all endeavors: at the beginning. I get so many questions about advice on how to start a blog and now I'm here to help. So you want to be a blogger? Let me walk you through some important tips and tricks to help below! The first step to starting a blog is deciding what you want to write about. The more common topics are fashion, lifestyle, family, travel, food, etc. You could also get more specific like NYC living, luxury travel, work-appropriate fashion or even the uber-specific like best Bloody Mary’s and French toast in Manhattan (I would write this as a second blog). When deciding your main verticals for the blog try and think what makes you different. Why would people want to read your blog over someone else’s? What makes you stand out? What can you bring that has yet been brought? Things like this are really important in today’s blogging landscape. The market is totally oversaturated and therefore a lot of blogs are the same. But as a reader, no one wants that! Ah the ever-so-important name! This is an overlooked but highly important part of the blog process. You want a name that can grow with you, that is easily brandable and something that will never go out of style. My personal recommendation at all times is to use your name or use a play on words for your name. Your name is great because it’s unique to you, it’s easier for you to brand yourself and your image and it’s something that will never be taken away from you! Girls who I think do a great job at this are Lauren and Jane. The worst thing you can do is a generic “noun & noun” name. It’s SO overdone and super easy to get mixed up with other blogs by similar nouns. The last thing you want to do is redesign/rebrand after a couple good years. It’s a lot of stress and time that could easily be avoided if you start out with a strong name. There are a ton of different sites to host your blog on. I personally have found the two most popular ones are WordPress and Blogger. There are pros and cons to each of them and I constantly go back and forth on the struggle of deciding between the two as well. Since day one I’ve been on Blogger. I think that’s where a lot of girls first start out because it’s free, it’s easy to use and it’s an established platform. I personally like it also because it’s hosted by Google which basically controls the internet and they love to promote their own product. I can’t speak much to WordPress because I’ve never used it but I’ve almost switched over a few times. They have a lot of really appealing plug-ins that make your site a lot more interactive, SEO friendly and a better user experience. If I had to do it all over again with the knowledge I have now, I would start out with WordPress but I always suggest new bloggers to start on Blogger. It's a good way to get your feet wet without committing a lot to the process. That and you’re not aware how invested you’ll be in the blog, so you don’t want to start by spending too much money! The good thing about everyone and their mother being a blogger is that there are a ton of places to get a good blog design created. When I started, designers were few and far between and a lot of times your only option was an Etsy pre-made blogger template. When I started, I personally wanted to challenge myself to build my own blog and learn to code. Which I did, and it lasted about a year before I really invested in some blog work. What’s so great about the internet is that you can Google anything you want to learn – how to put “pin now” pop ups on your photos, how to create a drop down, how to enrich your SEO... everything! There are so many great resources for you to learn about whatever platform you’re on. When I did my most recent blog redesign, I went to my favorite bloggers and took notes of different things I liked/didn’t’ like from each site. I liked that one blogger had this feature, or that another blogger did something fun with sorting content, etc. So when I helped design my site, I generally knew what I wanted. The whole process took about six months and it was a pain. It was a lot of back and forth but the good thing is that once you get the big things done, you can help edit the little things going forward. So be sure to research, design, sketch, take notes, be patient and be thorough. Now that you have everything in place, your blog is officially named, designed and made! You’re good to go, right? Well now you just need to create some content. Start out strong and let people know you have arrived! I always suggest quality over quantity so really make sure to publish good and strong quality content that will have your readers coming back for more. 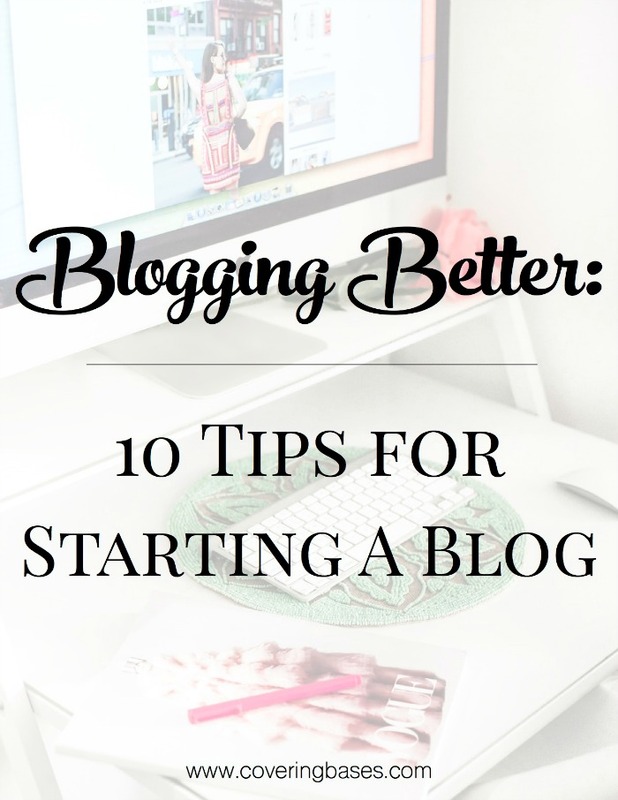 Check back next week for part two of Blogging Better: Starting Your Blog, where I go over the last five tips. If you have any questions or topics you'd like covered in this series, please let me know down below! Love these tips!! Thank you for sharing! That's SO great that you learned to code! I'm trying to pick it up, but it's like learning a different language. So helpful though! Enjoying this series so far!! So glad you're going to start this as a series on your blog; I really enjoyed reading these over the holidays when you were sending out your newsletter! Thanks so much! This is great advice! I'm excited for this series, starting a quality blog is so much harder than people realize. Thanks for sharing your experiences and tips! Love these posts! Thanks so much for sharing your tips/secrets! I just started a fashion blog recently so this information is very helpful and encouraging. I love these posts and they are so helpful! I currently blog on Wordpress.com and I am looking into upgrading because I want my own domain and to customize my theme. I just have a few questions about blogger because I am not really able to spend a ton of money on hosting. Can you upload any Blogger template you purchase on Blogger or do you have to pay a monthly subscription to do that? Do you have to be self hosted to get a domain on Blogger?